At a loss of where to take your bae out this Valentine’s Day? Take her to Caffé B, a Japanese-Italian restaurant located at #B1-15 and #01-83, The Shoppes at Marina Bay Sands! This Valentine’s Day, Caffé B has launched not one, but two menus, designed especially for lovebirds like yourselves! Enjoy the al fresco dining at the bar, and toast to a romantic evening against the Singapore skyline; or indulge in the quiet elegance of each other’s company at the restaurant. Start the evening with a unique combination of prawn wrapped with dory fish, and the creamiest mashed potatoes you’ve ever had. 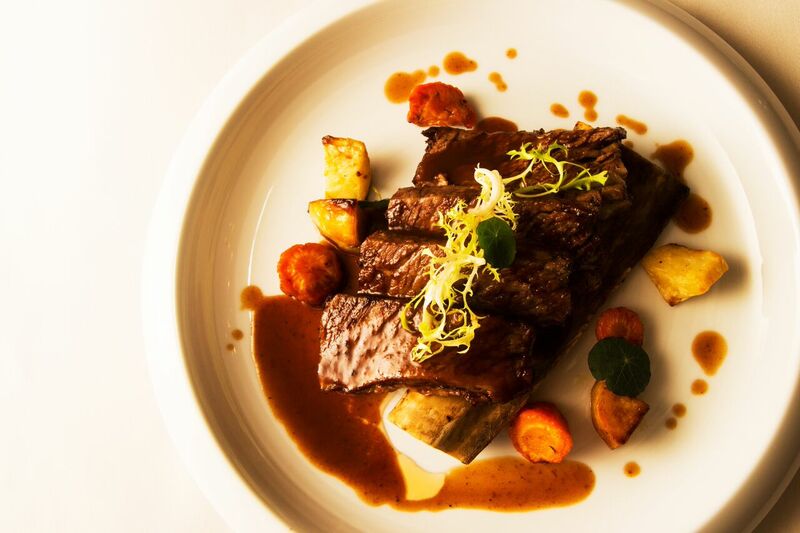 The hit of the menu, really is the beef short rib braised in red wine. Aptly named “Love at First Bite”, the beef is braised to a “melt-in-your-mouth” perfection. You can’t help but go “hmmm” in orgasmic delight, right from the first bite. 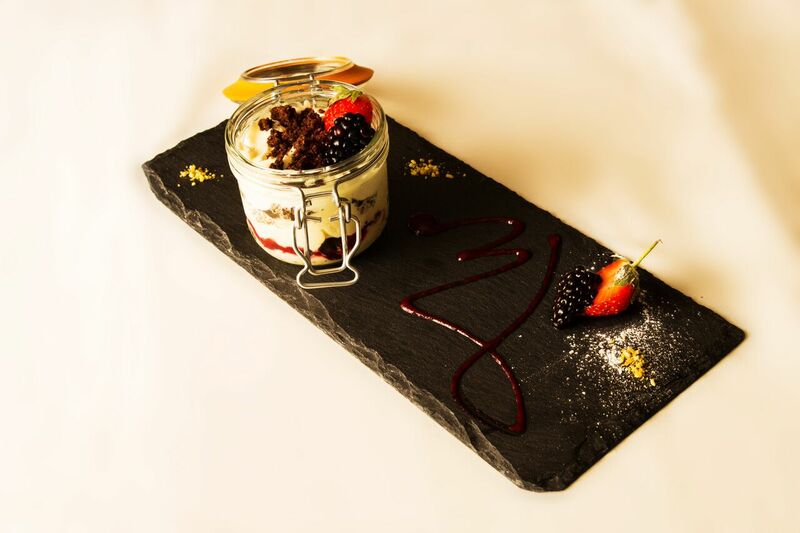 Dessert is white chocolate and yogurt mousse, topped with black biscuits, raspberry coulis served in a jar. The presentation is adorable and it will certainly delight you if you have a sweet tooth. If you are feeling a little more generous and really wants to treat your darling to a good dinner, you should go for the restaurant menu instead. Priced at S$280 per couple for six courses, it is not exactly bank-breaking. And trust me, the food is more than worth it. 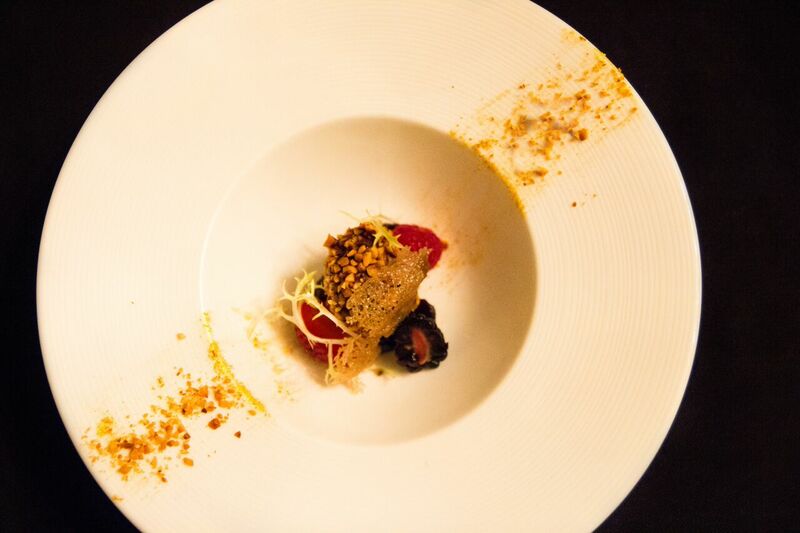 You begin with a bite sized amuse bouche, just sour enough to tease your appetite and get you ready for more. This is followed by a gorgeous foie gras Rocher. This dish may be a bit strange for locals as it felt like having dessert in the middle of a meal. Though, if you are usually hesitant about foie gras because of its strong taste, please try this dish anyway. 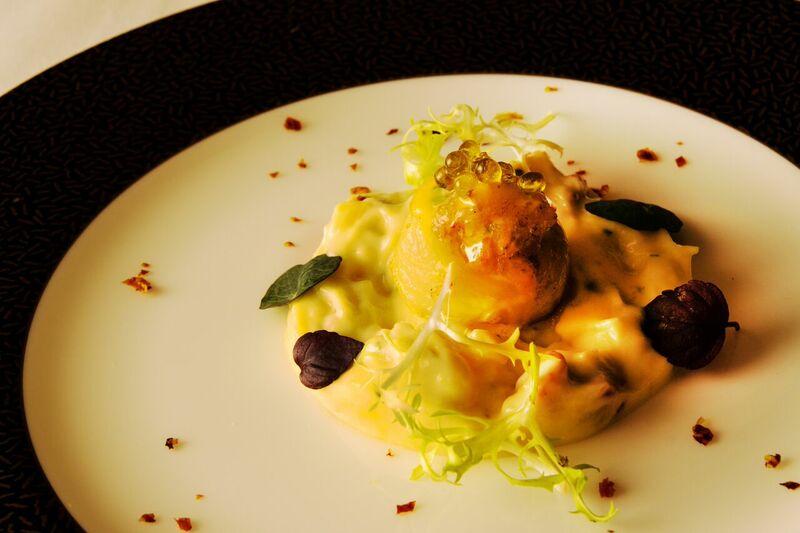 The taste of the foie gras is buttery, yet surprisingly subtle, and unlike any of the foie gras dishes we usually have. After the soup, you get a choice of pasta and main course. I will highly recommend the risotto. Here’s a confession: I hate beetroot. 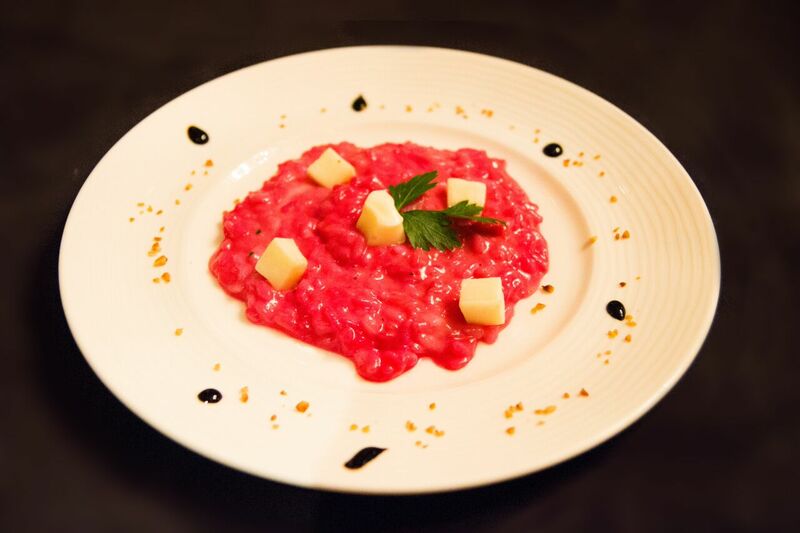 I thought I was going to hate the risotto when it was brought out of the kitchen, all bright pink and beetroot-y. Quite the opposite happened. I loved it! The sweetness of the beetroot, the umami from the torched cheese, with the crunchy texture from the nuts… I ended up fighting my dinner companion for the very last bit of risotto, licked right off of the plate. 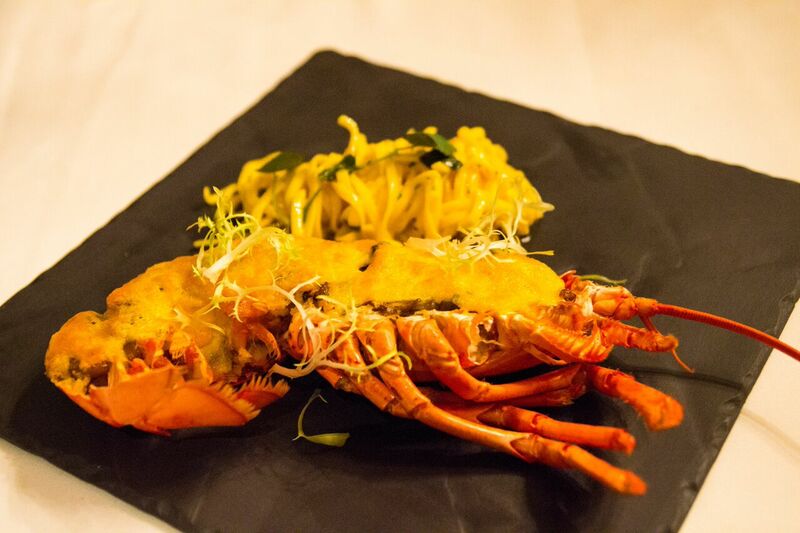 Both main courses are strongly flavoured, so it really comes down to whether you prefer beef or lobster. I usually like both, but this time, I must give my vote to the lobster thermidor. A word of caution though – the pasta may be a little salty on its own. But when you have it with the sauce in the lobster, it was- (and at this point, I have to pause in my typing to salivate at my memories of how good it tastes). Do head down to Caffé B if you are looking for a place to take your sweetheart this Valentine’s. The menus are available exclusively from 8th to 14th February. Please contact the bar or the restaurant at +65 62222 2329 or +65 6887 3311 respectively for reservations.